Security guard tour system capabilities have come a long way, leaving the old “pipes”, “wands” and keys-system guard tour technology behind. 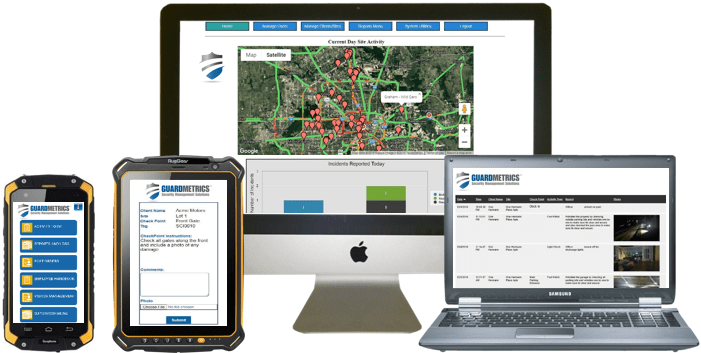 The GuardMetrics security guard tour system tracks your officer’s tours in real-time by means of checkpoint tag scanning and GPS triangulation. This kind of situational awareness allows you to provide real security in real-time. Armed with your officer’s locations–both in real-time and stored within the guard tour system for later viewing–you are able to provide your clients with quick answers, and even dispatch your closest mobile officers to a security incident. With GuardMetrics, you can now give your clients true peace of mind by showing them that your officers are delivering excellent service year round. The GuardMetrics security guard tour system is easy and affordable, yet comprehensive; including a guard tour tracking and mobile incident reporting app. It even includes a couple benefits not available in other guard tour systems; maybe in a PSIM, but not in any tour system CLOSE to the GuardMetrics price point, at any rate. DEMO this dynamic, yet easy-to-use, security guard tour system solution and guard tracking app. The best security guard tour systems include many of the same features: Guard tour and patrol GPS tracking, mobile reports with embedded photos and videos, post order management, timestamps and geotags, checkpoint scanning, exception alerts, visitor management, etc., and the GuardMetrics guard tour system is no exception. But where this tour system breaks ahead of the pack is with special features like facility access management, Task Management (to keep the the everyday issues in order, that often fall through the cracks otherwise, sometimes costing you business), guard contract bid-pricing software, and the electronic “neighborhood watch” app: The Community Security Portal. We have never seen this combination of additional benefits in any other security guard tour system! GuardMetrics offers peace of mind to your officers as well. Its innovative task management technology, checkpoint instructions, and mobile post order access keep expectations clear and instructions right at your officer’s fingertips. Our mobile security guard tour system geo-tags and time-stamps all events, from checkpoint scans to DARs (Daily Activity Records) to Incident Reports. You will even have a satellite photo attached to each event submitted. GuardMetrics tour tracking app allows you an easy way to see what is happening with your security officers in the field, and communicate with them accordingly, 24 x 7. Call GuardMetrics to discuss a guard tour system & security guard app with the features to put your guard business ahead! Guard tour checkpoints–NFC/ RFID or QR Code–are created and swiftly deployed according to your client’s needs, and QR Code at NO CHARGE TO YOU! This security guard tour system allows you to easily attach instructions to any checkpoint to make expectations clear for your security officers. These instructions can be specific and short-term like, “There was an attempted vehicle theft on Saturday the 12th of May. Double sweeps this week”, when the officer scans the “back-lot” checkpoint, or, the instructions can be long-term like, “Make sure your location services are activated on your mobile device” when the officer scans the “Clock-in” checkpoint. The guard tour system even allows you to easily set an “exception alert” on any scan, whether it be to notify you that a guard has not clocked-in on time, or a specific point was not checked/ scanned when it was supposed to be. The security guard tour system allows your officers to clock-in and clock-out by simply scanning a corresponding checkpoint when they arrive at and leave a site. From there you can run a “Timekeeping Report” to check against scheduling, payroll and billing. You can run a report to find how many total hours were logged for a particular site and time period, or you can simply see how many hours a guard put in last week. You set various permission levels in the guard tour system, from full access, to “site-lock”. 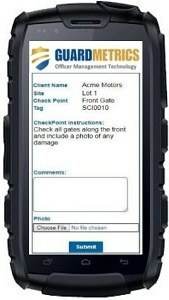 Site-lock simply means that, from the time an officer scans their first checkpoint, all mobile checkpoint scanning, reporting & post orders will be “locked” to that site until they are directed to go to a different site; that is to say that they will not see a drop-down menu of your client list to choose from. Call GuardMetrics or click here to experience a security guard tour system and app that takes scanning checkpoints to the next level. Once again, the development of the GuardMetrics security guard tour system was/is based on making the tasks that your security service needs accomplished as simply as possible for you and your officers. iPhones, Google Phones, Windows Phones and Android phones and mobile smart-devices automatically send alerts to your/ supervisory mobile phones, and push real-time information to a “Management (administrator) Portal”, accessible from anywhere in the world. And getting the reports to your clients with the GuardMetrics guard tour system has never been easier for you or them! 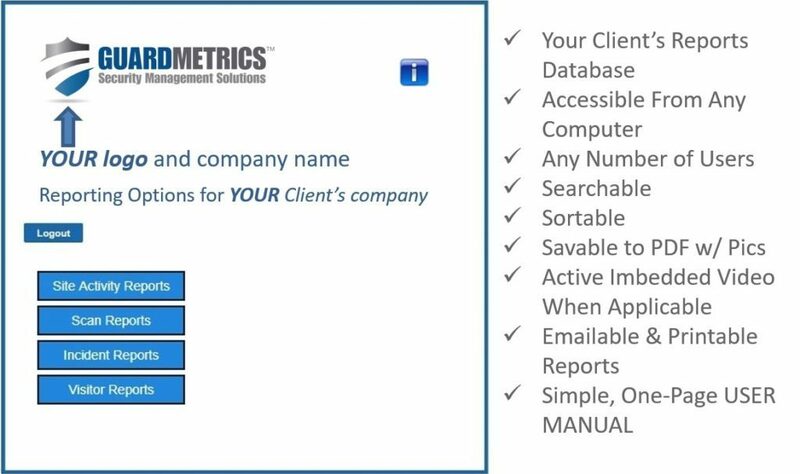 The GuardMetrics “Client Portal” is your client’s own personal REPORTS DATABASE. It is far superior to email and extremely easy to use. The Client Portal is branded to YOUR security guard business and list’s that clients site as well. Here, the guard tour system stores all of that client’s reports, which is searchable, filterable, printable and/ or emailable if they wish. With the simple report filters at their disposal, this aspect of your security guard tour system enables any administrator with permission at that client site to run a report using exactly the parameters they wish, to view the data, or to save the branded report and email it elsewhere. As your client’s security officer service of choice, you decide if the security guard reports feed directly into their Client Portal in real-time, or if you prefer to do a simple and swift approval each morning before reports feed into all corresponding Client Portals. Real-time data and branded patrol and tour reports are at your fingertips with GuardMetrics’ security guard tour system. With our expert set-up, training and support–performed by persons with decades in the security guard and software industries–you can deploy GuardMetrics security guard tour system software quickly, easily, and affordably, and bring to the table the kind of high-tech security team that’s in demand from today’s clientele. Call GuardMetrics to DEMO our simple and affordable mobile security guard tour system app.